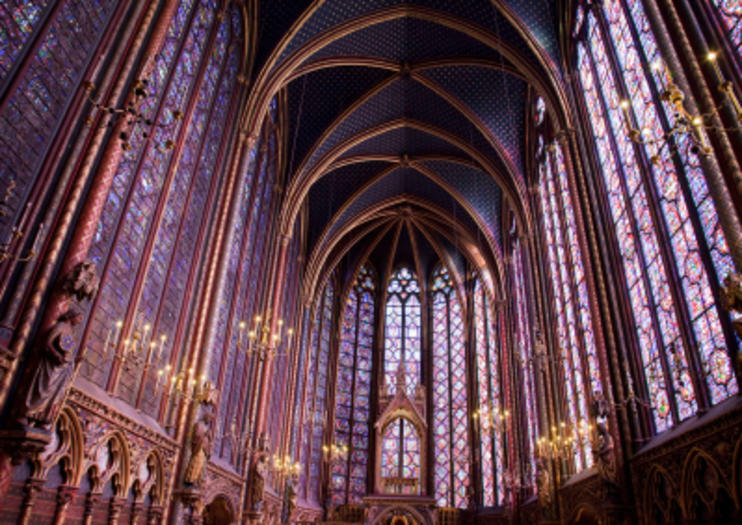 Built by King Louis IX to house a relic of the crown of thorns—now kept at nearby Notre Dame Cathedral—the 13th-century Sainte Chapelle is renowned for its striking Gothic architecture and some of the most exquisite stained glass windows in Europe. The Sainte Chapelle is part of the Palais de la Cité, and entrance is included with the Paris Museum Pass. Visitors can purchase a combination ticket including skip-the-line access to both the chapel and the adjoining La Conciergerie, where Marie Antoinette was imprisoned. Official Sainte Chapelle tours are conducted in French only, so book a group or private tour if you want to explore the chapel with a guide. For the best value, opt for a walking tour of the Île de la Cité, which includes visits to other attractions such as the towers of Notre Dame or a Seine River cruise. All visitors must go through a security check. Large bags are not allowed inside. Audio guides are available in 11 different languages. Most areas of the Sainte Chapelle are wheelchair accessible. Sainte Chapelle is located on the Boulevard du Palais, on the Île de la Cité in the middle of the Seine River. It’s a short walk from nearby Notre Dame Cathedral, and the closest metro station is Cité (Line 4). Alternatively, ride the RER or metro (Line 4) to St.-Michel Notre-Dame and walk across the Pont Saint-Michel. The Sainte Chapelle is open daily year-round, but it can get crowded in peak season, so opt for an early morning visit to avoid the crowds. The most impressive time to admire the stained glass windows is in the morning or late afternoon, when the sun shines directly through the glass. The magnificent Upper Chapel is the star attraction of the Sainte Chapelle. It’s encircled by 15 gigantic stained glass windows, each towering 49 feet (15 meters) high, which depict 1,113 scenes from the Old and New Testaments. The 13th-century artworks have been painstakingly restored and are joined by the 15th-century Rose Window to create a dramatic effect, bathing the chapel in multicolored light.